Page from the diary of Ebenzer Miller, 1762-1768. From the Samuel Hopkins Miller Collection, Special Collections, SBU Libraries. Special Collections announces the opening of an important collection for historical research that documents a Long Island family and community dating back to 1705. Historian and author Willis H. White has donated the Samuel Hopkins Miller Collection, an archive comprised of 26.5 linear ft. (25 boxes) of account books, diaries, ledgers, correspondence, and land deeds (ca. 1705 to 1967) from several generations of the Miller, Tuthill, and Tillotson families on Long Island, New York. The geographic coverage is focused in the areas of Miller Place and Rocky Point in the Town of Brookhaven, Suffolk County, Long Island, New York. The guide for the collection can be accessed here. Samuel Hopkins Miller (1853-1937) was born in Miller Place, New York and married Alilah Young Tillotson (1857-1936) on September 18, 1878. They had two children: Grace Julia Miller (1879-1967) and Alila May Miller (1881-1960). Diaries of Alila May Miller and Ebenezer Miller (1762-1768), subjects of scholarly works written by donor Willis H. White, are represented in the collection. Captain Ebenezer Miller (1733-1785), a farmer, was born at Miller Place, Long Island, New York, the son of William and Deliverance Mills Miller. He married Sarah Strong (1740-1836), daughter of Benajah and Martha Mills Strong. They had seven children; four of children were living at the time the diary was written. Active in church and in town affairs, he was one of two elected representatives for Suffolk County to New York’s Legislative Assembly in 1768 and 1769. In September 1775, he was chosen as Captain of the 2nd Brookhaven Company in Colonel Floyd’s First Regiment of the Suffolk County militia. In 1781, his fifteen year old son William was shot from outside of the family’s house in Miller Place by raiders infiltrating from Connecticut. Descendents of the family also served in the Civil War. Additional surnames part of the family papers are: Blydenburgh, Brown, Chappell, Davis, Halleck, Hedges, Hopkins, Jones, King, Marshall, Mott, Norton, Prout, Reeve, Rowland, Satterly, Schlim, Skidmore, Smith, Snow, Stanton, Terry, Thompson, Tuttle, Wells, Woodhull, Youngs. Collection donor Willis H. White is the author of four books that draw upon the source material in the collection. Copies of these volumes are located in the Main Stacks and in Special Collections at Stony Brook University Libraries. Miller, Ebenezer, Margaret Davis Gass, and Willis H. White. 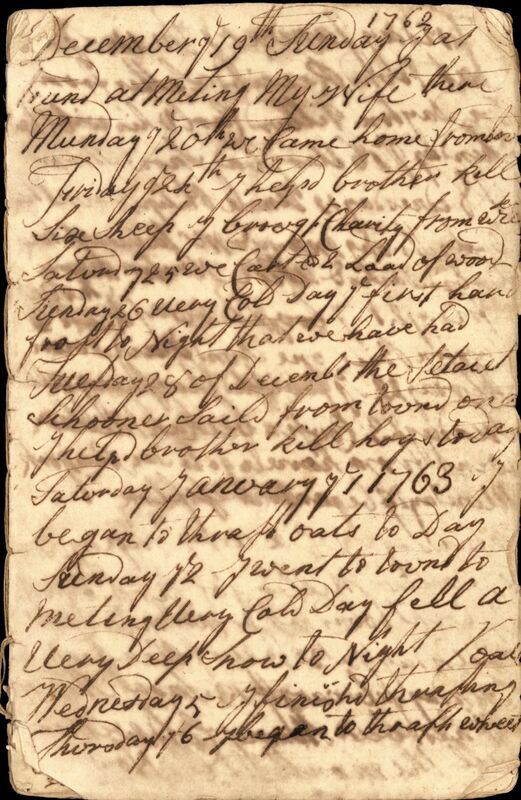 Diary of Ebenezer Miller of Miller Place, Long Island, New York, 1762-1768. [United States]: W.H. White, 1996. White, Willis H. The Tillotson Family of Long Island, New York: Three Generations of the Descendants of Samuel Tillotson.Herndon, VA: W.H. White, 2002. White, Willis H. The Ancestry of Alila May Miller (1881-1960) of Miller Place, Long Island, New York. [Herndon, VA]: [W. White], 2007. White, Willis H. The Tillotson Family, Long Island Cordwood, and the Decline of East Coast Sail. Herndon, VA: W.H. White, 2008. For more information about Special Collections at Stony Brook University Libraries, please visit the department website.